Featuring Internationally and Nationally recognized artist Romagean Personne (National Museum of Women in the Arts) and a selection of Colorado’s top artists. EXPERIENCE THE DIFFERENCE! 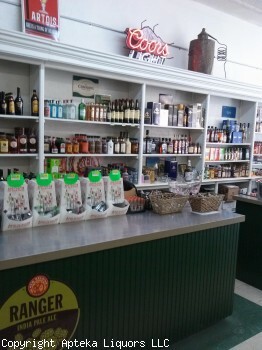 We focus on all beers, wines, & liquors Made in Colorado & surrounding areas along with all the well known brands you expect; plus we carry ice & more. Unique gifts: local artwork, wall hangings, jewelry, housewares & furnishings, Wood Wick candles, Honey House Naturals lip balm and lotions, crystal stemware, bowls vases, scarves, headbands, etc. Christmas room: Dept. 56 and Snowbabies…and more! 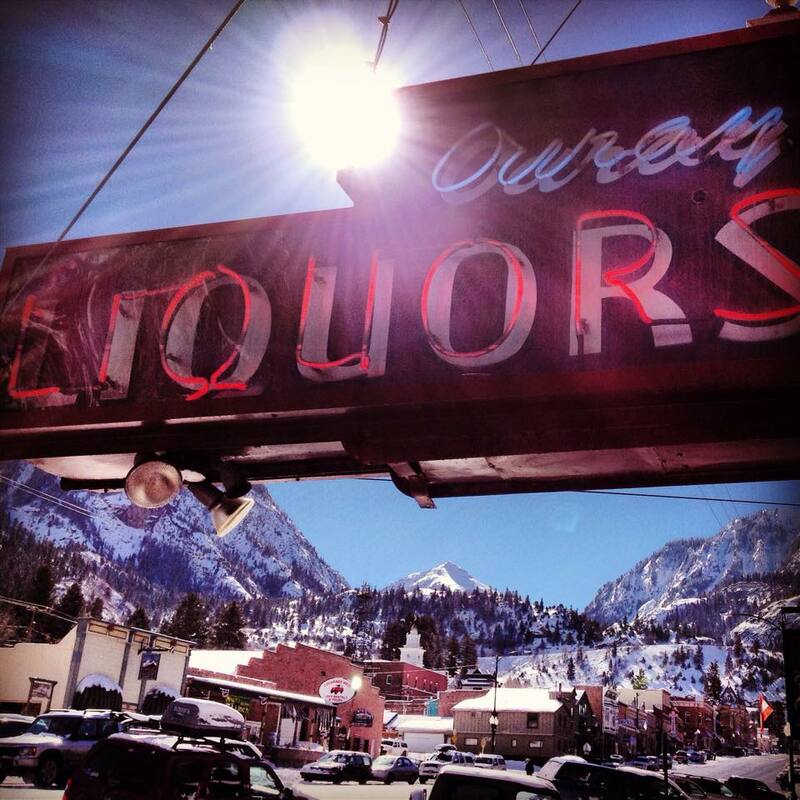 The historic Beaumont Hotel & Spa is the only luxury boutique hotel in Ouray, Colorado. Surrounded by snow-capped peaks and located in Colorado’s “Switzerland of America,” the setting is unique, the experience unforgettable. Guests are treated to modern amenities, including wireless high-speed internet, and outstanding personalized service paired with timeless old world ambience. Elegant, authentic decor, exquisite antiques, and custom-made furnishings combined with on-site dining, shopping, and concierge services make this award-winning boutique hotel a delightful destination. Full of wonderful doodads, an eclectic mix of home decor , antiques, and fun things! Kiln-formed glass studio specializing in frit painting and fused glass realism fine art and glass dichroic jewelry. Gifts for the home, body, garden, and soul! We are a full-service bookstore with modern best sellers, local guidebooks & maps for hiking & 4-wheeling, Colorado history, geology, women of the west and other books. Also cards, posters, newspapers, magazines & gifts. 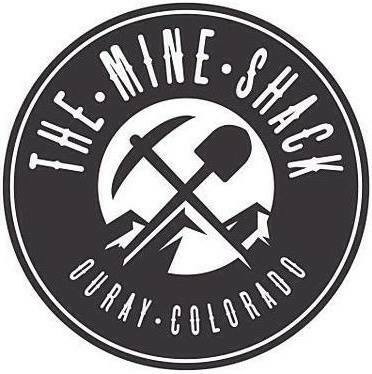 The Columbine Mineral Shop has been serving collectors for over 35 years. Located in beautiful Ouray, Colorado, we have specimens for everyone from the beginner to the advanced collector. Now we are bringing the shop from Colorado onto the net. Denim of Antiquity features one-of-a-kind denim designs. 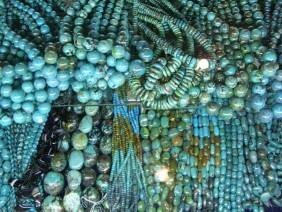 The Ouray resident “wearable art” has been featured in boutiques, galleries, and trunk shows all over the country. This unique shop has perhaps the largest supply of beads, findings and all necessary hardware on the Western Slope if not in the state. Beautifully displayed merchandise with eclectic variety. Locally made Colorado Jewelry, Hats, shirts & jackets. High Country Leathers has been providing quality apparel since 1987. We specialize in Western wear, Biker gear, Hiking accessories Purses, Southwestern fashion, and Jewelry from around the world. We carry the best name brands such as Filson, Pendleton, Vasque, Minnetonka, Ugg, Brighton, Fossil, Outback, Elope, Ameribag, Shady Brady, Goorin, Smartwool, Sherpani, and some great merchandise from people you may not have heard of. We are the fun store people talk about! Come by and visit. 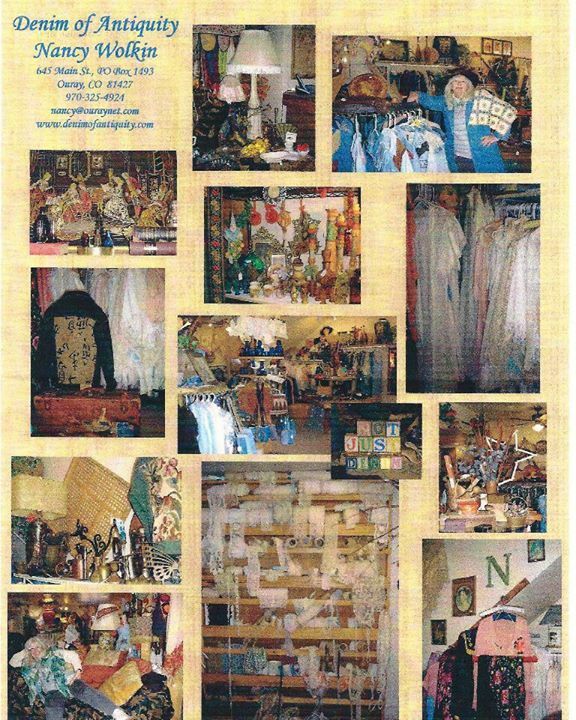 At Ivory’s Trading Company and Gallery, we have always been admirers and collectors of art and feel fortunate to be in the business of buying and selling top quality bronzes, Navajo Rugs, hand-coiled Indian pottery, baskets, paintings and jewelry handmade by famous artists from the Ute, Navajo, Zuni, Hopi, Northern Cheyenne and many of the other 19 Pueblo Tribes. We carefully research and select authentic Native American items that reflect the richness of their culture. With deep appreciation and respect, we bring these art forms to you. We hope you will appreciate them as we do. If you are ever in this area to enjoy the raw beauty of the Rocky Mountains and want to see the area where John Wayne filmed “True Grit”, please come visit us and introduce yourself. We would love to meet you. Only the coolest little kitchen shop on the Western Slope of Colorado! 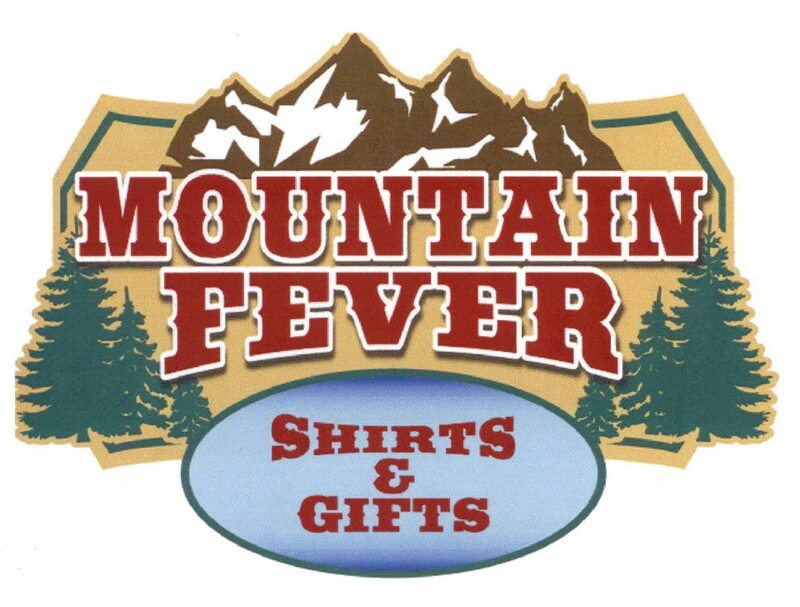 Stop in and shop at Mountain Fever Shirts & Gifts for the best selection of t-shirts, caps, hoodies, fine gifts and souvenirs, Colorado and USA made artwork, jewelry, Burt’s Bees, nail art, crystal, books, maps and much more! Mouses Chocolates & Coffee, each made right here by the Chocolatier, using imported Belgian Chocolate. Coffee roasted on premises. Espresso drinks, Coffee, Milkshakes, Salads. We ship! Everything you could want from a toy store you will find right here at O’Toys, from baby toys to educational games, nostalgia items, and dress-up clothes. Challenge your family on the indoor Putterville Miniature Golf course. Call for availability for children’s birthday parties. 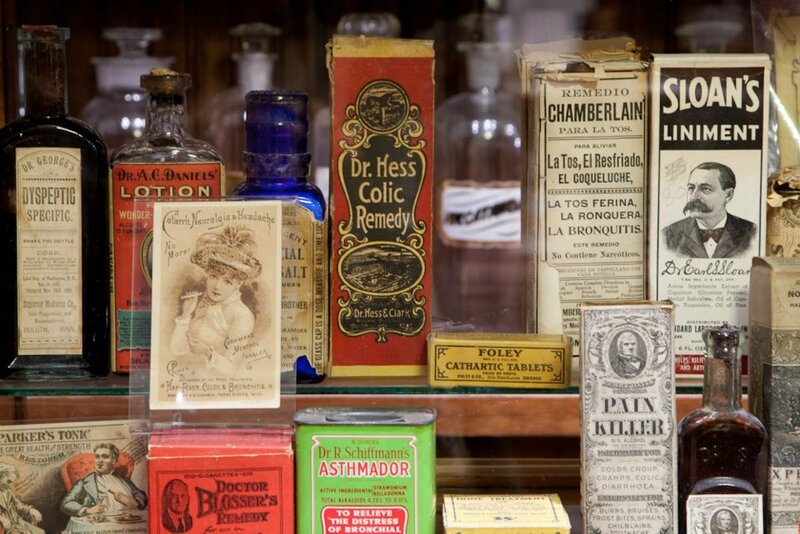 Extensive historic pharmacy and medical collection dating back to 350 BC for your viewing with a special focus on Colorado and Wild West pharmacy related items. Admission charge of $6.00 to that area of the store includes an extensive personal tour. $5.00 seniors & students with children under 5 free. Antiques, unique finds, jewelry, art, collectibles, oxygen, t-shirts, old fashioned candy and over the counter drug items including free pharmacist advice. From the San Juan Range of the Rocky Mountains of Colorado and into your home, Ouray Artist Sam Rushing creates beautiful handblown glass with brilliant colors and quality. For more information about Sam Rushing, Ouray Glassworks & Pottery, or the many beautiful products, please contact Ouray Glassworks. Although Ouray Glassworks would prefer you to call, they are always glad to answer any questions or comments sent via email. Offering the region’s most exciting selection of craft, import, and domestic brews with an extensive wine inventory and thorough spirits section. Vapor products, tobacco products, mixers, and ice available as well. Serving Coffee, specialty drinks & Smoothies, Breakfast and Lunch. Arts and Gift Store featuring lots of Colorado Artist and Made In Colorado products. Large patio and Handicap access. Ouray Mountain Sports caters to the high-end rock climber or alpinist as well as the hiker, trekker or just your average outdoor enthusiast. We have gear for every level for outdoor fun. Located in Ouray, Colorado, in the heart of the San Juan Mountains, we have a great selection of equipment to help you pursue all your outdoor passions. Now Ray’s Good Stuff offers a full-line of Jerky, Strips and Sticks as well as our mouth-watering all natural creamy Amish Caramels. The rustic elegance of Rockin-P-Ranch’s upscale, Southwestern retail store offers unique products in the following categories: Women’s Clothing, Jewelry, Scarves, Purses, Boots, Furniture, Rugs, Lamps & Tables, Decorative Accessories, Fine Art & Framed Prints, Children’s Clothing, Design Service Available, Gifts from $2.99 and up. Skol Studio Gallery displays a diversity of fine art. Jeff Skoloda, gallery owner, creates sculpture, furniture, and architectural designs using metal often accompanied by stone and wood. Many other artists are also represented at Skol Studio Gallery. Their works include: Paintings, Glass, Wood, and Fabric. We are also in the process of creating an outdoor sculpture garden. Stop by and see what we have to offer! The Blue Pear offers a variety of gift items and items for self-indulgence. This small but mighty shop has an ever changing selection of soaps, lotions, linens, and jewelry. At the Wildflower Boutique, you will find unique clothing, accessories and gifts. Beautiful hand-crafted jewelry. 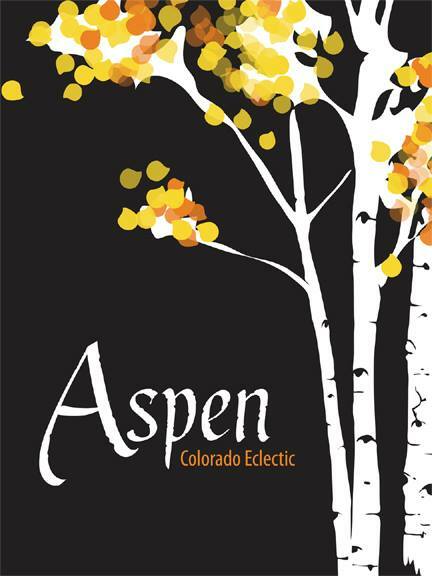 Colorado-made gifts including body care products, candles, soaps, handbags, frames and coasters. A store with a conscience where finding the perfect gift is a pleasure.